South Korea is aiming to become the world’s first country to offer commercial service for the 5G network. The government, three mobile telecommunication companies (SK Telecom, KT and LG Uplus) along with device makers have put out a total war effort for this day. However, ahead of the commercialization of 5G service, LG Uplus has announced its 5G data plans. The company’s CEO and vice chairman also said that 5G service is a golden opportunity for LG Uplus to change the landscape of the telecommunications market. 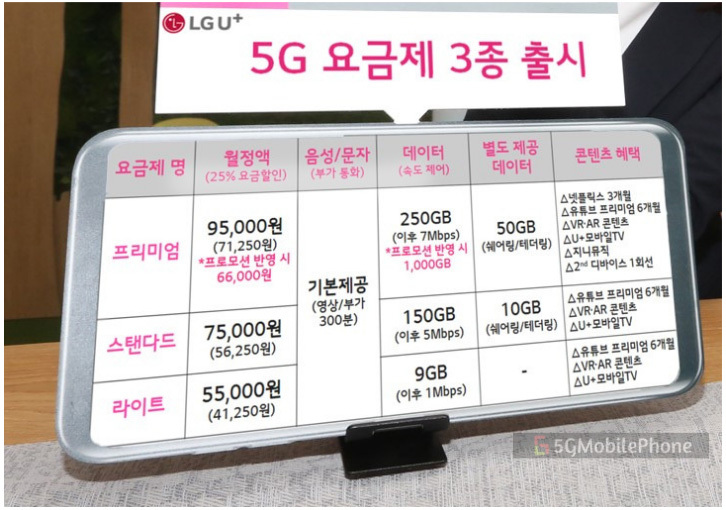 LG Uplus announced three monthly 5G data plans ranging from 55,000 won ($48) to 95,000 won ($84). These are listed below. 5G Lite: Under 55,000 won plan, users will get 9GB per month. After the high-speed data limit is hit, speed will be throttled to 1Mbps. 5G Standard: The 75,000 won plan provides 150GB per month (5Mbps speed limit after monthly consumption). 5G Premium: If users opt 95,000 won plan they will get 256GB data per month (7Mbps speed limit after exhaustion). As a promotional offer, the user can avail 25% discount on monthly LG Uplus 5G data plans. So the price of the plans will go down to 41,250 won, 56,250 won and 71,250 won respectively. Moreover, If users subscribe to the 75,000 won and 95,000 won plan, they will be provided additional 10GB and 50GB respectively that can be used to share data with the second devices. The smartphone manufacturers are also ready to unveil their 5G smartphones in the domestic Korean market. Samsung Electronics said that Galaxy S10 5G would hit the market on April 5. LG Electronics also said that they would release their 5G Smartphone V50 ThinQ on April 19, 2019.